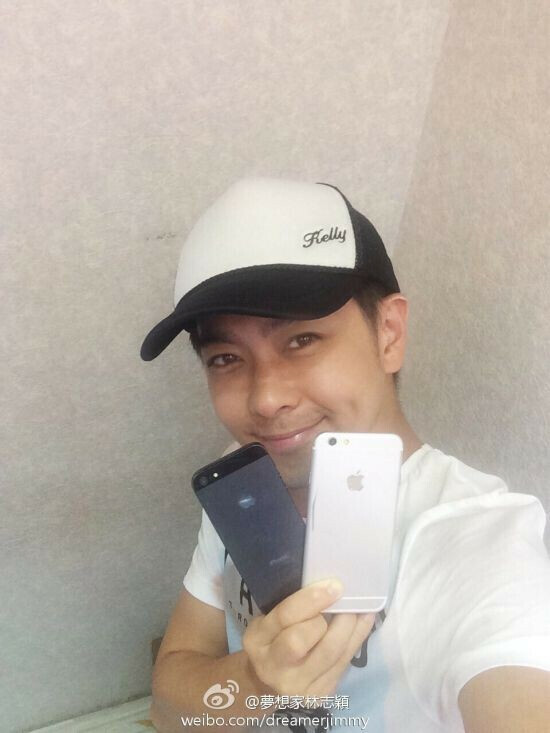 Not that we've had any doubts about Jimmy Lin's connections, but now another source is confirming that the iPhone, which the ex-teen idol showed not long ago, is indeed an iPhone 6 Beta sample. The source has apparently been one of Apple's Hong Kong employees, who had been given several such samples for testing purposes. Jimmy Lin already outed the iPhone 5 two years ago, and that one turned out to be credible, so we have every reason to believe that what he is flaunting at the picture on the right, might indeed be very close to how the final iPhone 6 will look like. Interestingly enough, the Apple insiders from Hong Kong also mentioned to the source the upcoming iPhone will sport a 2K Quad HD resolution display, though it's not entirely clear if they meant the rumored 4.7" or 5.5" one. So far we've been hearing that the 4.7" iPhone 6 will sport a pixel-tripled 960 x 1704 resolution, with pixel density on about the level of the current iPhone 5s, despite the enlarged screen size. In any case, QHD might be just one of the resolution Apple has toyed with in the prototypes or testing samples, so we'll believe the 2K rumor when we see it. Agreed, iPod touch body with HTC One antenna bands The very top antenna band looks terrible, why not just two like the M8 4.7" screen like Moto X, but probably the size of the S4 which has a 5"
For me it looks like fusion of iPod Touch 5, HTC One with buttons from Nokia Lumia 925. Probably looks ok IRL as space gray (or black). The Touch has a 1-piece back. This sample has a multi-piece back. Personally, I think the iP5 looks cleaner, design-wise. This version of the iP6 just looks... uninspiring? The plastic/polymer that separates the back panels is just ugly and accentuates the gap. Ugh! I agree, the screen-bezel ratio is around 66%, like the Galaxy S3 and just below the Nexus 4, both of which are 2012 phones. Design-wise, the iPhone 6 would have been more fitting 2 years ago. No he won't, he won't even be the one to discuss it. Nice, but the white stripes are too bold. Shrink em down, and it's a winner. They need to shrink that front button, keeping things symmetrical is going to keep making the phone large-for-screen-size. The darker colors will probably look better, that shiny grey looks terrible with the white antenna strips (?). Looks very nice, like all iphones do. But like all iphones, it's the king of bezels! Apple, have you missed G2 and G3? Sorry but no iphones will have a QHD this year when they are so slow when it comes to current trends in terms of screen size and resolution. I like how the back looks, but the front is not that good looking or perhaps it's the angle of the photo? I'd have to see it in person. Please, no QHD. It's useless garbage on anything smaller than a 10" tablet. Ars Technica gigged the G3 in their review because of all the compromises. I honestly care nothing about the bezels, but do care about the screen being ridiculous and useless. Steve Jobs is rolling on his grave. You mean in it. Trust me, he's not on it dude. What with the flash? iPhone 5s had duel flash but the iPhone 6 will only have single led flash? If this is indeed the iPhone 6, the design looks a bit stale. It's like they phoned it in.